five + = fourteen Required Please enter the correct value. Gold prices managed to eke out a slight gain Friday to move back above the $1,560 a troy ounce mark – but the precious metal has had a less-than-stellar run this week, on track for a 1.9% loss. In London trading Friday, the spot gold price was up 0.4% at $1,563.71, bouncing from as low as $1,533.41 earlier this week. The upward move in gold came as the euro rebounded some from two-year lows against the dollar. The euro inched up from early lows against the dollar Friday, although sentiment around the troubled currency remains guarded. Gold's rise Friday also was attributed to bargain hunting, calmer markets and short covering ahead of the three-day holiday weekend. This week continues gold's eleven-week downward trend as the state of Greece and the entire Eurozone region has kept world markets on edge and investors jittery. Worries over Greece exiting the Eurozone prompted heavy selling in the currency this week as the ailing Mediterranean country, operating without a government, faces imminent default. "Gold's direction seems to be driven more by the level of market risk aversion and the euro currently," BNP Paribas analyst Anne-Laure Tremblay told Reuters. "Market sentiment on gold is fragile at the moment. There have been tentative rebounds, but so far bullish momentum has yet to materialize." As always, however, there's another side to this story. Money Morning Global Resources Specialist Peter Krauth explained earlier this week that the recent gold price tumble isn't setting the stage for a long-term trend. Krauth said the current European economic woes have been guiding investors away from gold, which has lost its shine as a safe-haven investment. "It's times like these when investors pour into the U.S. dollar for its "perceived safety," said Krauth. But the overall global outlook for the metal involves much more. "The demand for physical gold is still increasing," said Krauth. "According to the World Gold Council's (WGC) Q1 2012 trends review, they see record levels of Chinese demand, surging 10%, for a new quarterly high of 255.2 tonnes. They also see further growth, as the Chinese remain concerned about high inflation persisting. The demand is so great that China has surpassed India as the world's largest gold consumer." And don't bet on the U.S. Federal Reserve to stay out of the markets much longer – another round of monetary stimulus could well be on the horizon. "I've been saying for a while that it's coming," said Krauth. "With an election pending this November, odds are good we'll see QE3 before the end of summer. With falling stocks, retreating commodity prices, and weak jobs reports, it'll make the QE3 sales pitch a much easier sell than your average time-share." Krauth warned, though, that there may be more declines ahead for gold before the metal comes roaring back. 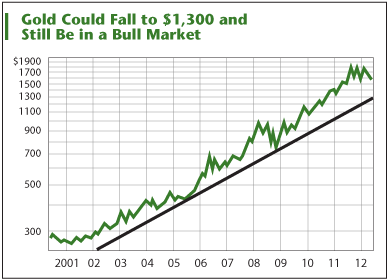 As this gold prices chart shows, gold could fall as low as $1,300 an ounce and still be in a bull market. "That's what happened when gold reversed from $200 in January 1975, and fell for 18 months to $100 in August 1976," said Krauth. "Certainly, a drop that big would have forced a lot of gold investors to sell. But the truth was that the best was yet to come." Commodities may be wounded, Krauth noted, but they're far from dead.